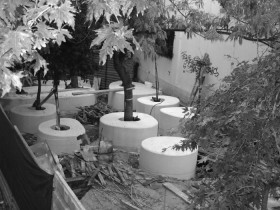 In the cases of National Garden and the playground, the nature of interventions, whic had to do with alterations of the existing landscape and cutting of trees, had an impact to some sensitive citizens, who reacted against them. Instead, the polishing of Syntagma’s square didn’t bother anyone at all, maybe because no one paid any attention to the rest of the news, that the maintenance of the square is undertaken by the hotel owner, with all that this entails. For the ever-growing metropolitan municipalities, the last expenses they are willing to pay for, in ranking of priority and urgency, is the maintenance of public spaces. Whole new, large areas are constantly added to the map and a solution is pending for all these remnants left over from what is private. In the more remote areas and suburbs the dissemination of collective practices has quite relieved the Municipalities from this burden. Although, moving towards the city centres, where the stakes are higher to be left over to collective experimentation and self-management, municipalities rely strongly on companies, even if the case is this of their more central, symbolic and crucial to public life spaces, as it is Central Park, Potsdamer Platz, or as it is now the National Garden. In fact it is the companies that resort to municipalities in order to gain the reciprocal benefits of having control over the usually adjacent public spaces. Many studies have been made to investigate the possible dark sides of this seemingly beneficial for the city initiative. Focusing on the question of publicness, Németh& Schmidt ¹ are trying to be as objective as possible, introducing various measurement models, grading factors such as lighting, security feeling, comfort, accessibility, variety of uses, user-friendly design etc. What comes out in general is that the public spaces of this category have a lot of elements which attract the public, such as seating corners, good lighting etc but they also have too many elements that control the kind of use, access and behaviours. That’ s to say a big number of visitors is favoured against the social mixing which is constrained. 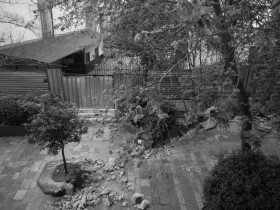 In the adopted spaces cameras are combined with other intangible control methods, turning out to be more effectively deterrent than any other means of physical control, such as fencing, regulation signs etc that characterize the “orphan” public spaces. But most of all, access and behaviour control is achieved through a complex net of subtle seduction, which uses events and design as tools for safeguarding security and order. Billboards, over-designed details and over-cleanliness point out a constant ubiquitous present surveillance, coming from above, ready to intervene in order to restore order, subconsciously deterring any non-typical behaviour. The most effective deterring tool turns out to be the use of “intense uses”, the “rich program”. The site which is devoted to NY pops, promotes the fair competition between the companies responsible for them, rewarding the best designed public space, the one with the richest program. Some Pops have even their own site, with a program that competes equally many cultural foundations. What seems as a sign of health, the excessive liveliness, ultimately results in more exclusion. Events on the one hand invite the crowds, giving a sense of liveliness, but on the other they create a closed universe for people of similar interests, excluding all those who just seek an escape from the frenzy rhythms of the city. Events are a directed production of “public life”, they are not real public life. They prevent the original Event of city life to emerge spontaneously and unnoticeably. Public space should be the empty container, the empty field of social life, but private management stiffly fills this empty field, creating more and more hectic situations and fake environments, thus weakening the social reflexes and identifying the urban experience with an addictive consumption of experiences. A successfully public space is not the one that manages to attract the crowds, thriving with life, but the one that can encompass them all offering a shelter in the increasingly disruptive, stressful environments of modern cities. It is also the quiet, contemplative space of resort, which is the case of National Garden. The increasing emphasis on rich artistic program, safety and design threatens the possibility of creating and maintaining such simple empty public spaces, open and welcoming to all, inviting to the serendipity of real life event. It is not a coincidence, that as long as lively public spaces are proven to be an attractor of entrepreneurship, especially the young and creative one, the most powerful institutions of America constitute international platforms dedicated to the research, study and implementation of “good public spaces”. The real public space though, by its nature cannot be produced by any individual initiative-it is always the result of our collective presence and action in the space of the city. In their survey Németh & Schmidt are calling on local authorities to stop rewarding intense art programs in public spaces and invest, instead, in “quieter” places, places that will include everyone. However, Amanda Burden, official in duty at the Municipality of NY for the design of public spaces, responsible among others for the highly discussed, controversial High-line park, in a speech she gave at Ted Talks about public spaces, concluded like this ” I believe that a successful city is like a fabulous party. People stay more because they have great time” obviously forgetting that even in the best parties there are some who don’ t know how to dance. The city belongs to them too. 1. Jeremy Németh – Stephen Schmidt, «The privatization of public space: modeling and measuring publicness», Environment and Planning B: Planning and Design, 2011, v. 38, 5-23.